The incumbent Congress government is heavily banking on the NLUP to attract the electorate. The chief aim of the NLUP is to develop and give all farmers in the state suitable, permanent and stable trades. The Policy also aims at giving all the village farmers self sufficiency and providing them with financial help along with necessary guidance. Illegal immigration from neighbouring countries such as Bangladesh, Nepal and especially Myanmar is another issue that will be highlighted by the opposition parties to hit four-time Chief Minister PU Lalthanhawla. According to the New York-based Human Rights Watch, there are as many as 70,000 to 100,000 ethnic Chins from Myanmar in Mizoram, who fled to India in the last two decades to escape massive human rights abuse in western Myanmar. The return of the 37,000 tribal refugees from Tripura is yet another issue that would have an impact on the result of the Assembly Elections. The tribal Reang refugees, locally called ‘Bru’, had fled their homes in several villages in Mamit district in western Mizoram in October 1997 after ethnic clashes with the majority Mizos flared over the killing of a Mizo forest official. In Mizoram, the estimated population of Reang tribals is 100,000. Besides, there are Chakmas and other tribals living in the mountainous border state, whose total population is about one million. Though the literacy rate in Mizoram is very high, yet unemployment remains an acute problem. Kolasib, Mamit and Serchhip districts fall under the jurisdiction of Aizawl and Aizawl Employment Exchange houses the highest number of registered unemployment youth in Mizoram. Recently, Haukhuma Hauzel, member secretary of the state Planning Board and chairman of the Mizoram Skill Development Society (MSDS), referred to records of the employment exchanges while saying said that there were more than 50,000 unemployed youth in the state. Development is one of the main issues in the state as more than 70 percent of the people of Mizoram are dependent on Agriculture. The incumbent government has worked hard for accelerating development in the state by implementing NLUP and policies to develop both land and water routes for trade. The use of drugs amongst the youngsters has become a serious issue for the north-eastern state. The Mizoram government is mulling a new drug policy to combat increasing number of drug abuse deaths. All the political parties stand united in combating this grave problem. Like any other Indian state, Mizoram is troubled by rampant corruption. The delay and suspension of several projects by the government has gained huge criticism from people. Perhaps, Mizoram is facing cultural degradation due to immense influence of outside world, which has become a much talked about ‘ill’ for long. The state is also disturbed by the strife between different tribes and the dominant Mizos calling the shots, while a few smaller tribes feel insecure. Taking note of the prevailing issues, it is imperative for political leaders to get their act together and fulfil the demands of people. And Biakmawia of the BJP contesting from Aizawl North -III is the poorest, with assets worth a little more than Rs 10,000. Former Speaker of state Assembly R Lalawia of Zoram Nationalist Party is the richest among the the 141 candidates who have filed nomination for the Mizoram polls on November 25. Lalawia is a contractor by profession and has assets worth over Rs 69 crore, his affidavit said. He has filed his nomination from the Serlui seat in Kolasib district bordering Assam. Meanwhile, Biakmawia of the BJP contesting from Aizawl North -III is the poorest, with assets worth a little more than Rs 10,000. Among political party chiefs, Chief Minister and state PCC chief Lal Thanhawla is the wealthiest with assets over Rs 9.15 crore followed by former chief minister Zoramthanga of the Mizo National Front with assets valued at Rs 2.16 crore, the affidavits said. According to the affidavit filed by the candidates, Lal Thanhawla has Rs 89,86,247.50 in bank deposits and his wife Lal Riliani has property worth Rs 85,59,733.69. Lal Thanhawla has landed property worth Rs 7 crore and the valuation of his wife's landed property is Rs 40 lakh, the affidavits said. Mizoram People's Conference chief Lalhmangaiha Sailo, a retired Indian Revenue Service officer, was worth more than Rs 2.1 crore while Zoram Nationalist Party chief and former Lok Sabha member Lalduhawma was the poorest among political party chiefs with assets valued at Rs 1.7 crore, the affidavits said. Tomorrow is the last date for withdrawal of candidates for election to the 40-member state Assembly. One of the main contenders for the Mizoram Assembly polls is Lal Thanawla - the current Chief Minister of the Mizoram and a member of Congress. After almost a decade, the veteran Congress leader brought the party back to power in the state in the 2008 Mizoram Assembly Elections, and is currently elected from Serchhip and South Tuipui constituency. A journalist by profession, Thanawla's political journey started when he joined the underground regional political party – Mizo National Front in 1966. However, he quit the party a year later and joined the Indian National Congress (INC) where he was appointed as the Chief Organiser of the Aizawl District Congress Committee. He was elected as the legislator for the first time in 1978 from Champhai seat. In 1979, he was elected from the same seat once again. The senior Congress leader was elected as the Chief Minister for the first time in 1984. However, he decided to step down and instead became the Deputy Chief Minister to make way for Laldenga. This is not the first time that the senior Congress leader has been voted to power. He has served as the Chief Minister of the state three times earlier as well. He has served the state as the CM from 1984-1986, 1987-1998 and in the year 2003. In 1987, he once again won the seat from the Serchhip constituency and was appointed as the Chief Minister of the state for the second time in 1989. He won the elections in 1993 again and formed an alliance with the Mizoram Janta Dal. However, the winning streak of the veteran leader was halted when he was defeated in the Sechhip in the 1998 Assembly polls. For the next decade, he donned the role of the Opposition leader in the state. He is also known to have initiated peace process between the Government of India (GoI) and the National Front of Mizoram during the two decades of trouble in the state. 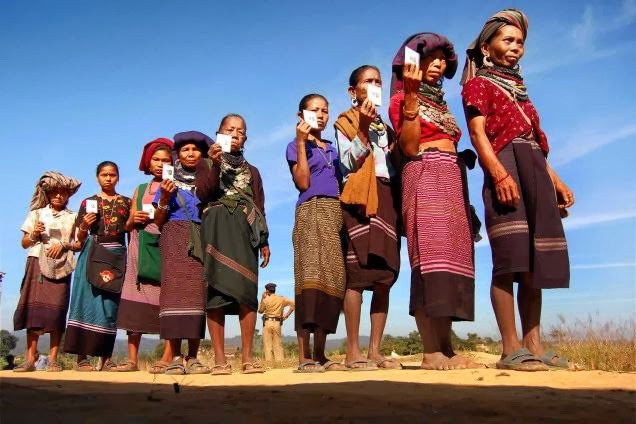 Bru voters lodged in the six relief camps in north Tripura district, who are bona fide residents of Mizoram, would cast their votes through postal ballots in the camps on November 19 and 20, state election department officials said. Elections to the 40-member Mizoram Assembly would be held in Mizoram on November 25. Following instructions from the Election Commission, the polling of Bru voters would be conducted by election officials sent from Mizoram. As per the arrangements made by the EC, the Bru voters would exercise franchise at the Postal Ballot Facilitation Centre where they would receive forms from the Nodal Officer of the centre. They would again approach the desk officers of their respective polling stations for postal ballots and submit the postal ballots in the drop boxes. Though the student bodies and the civil societies objected to the Bru voters casting their votes outside Mizoram, chief election commissioner V S Sampath said that the Bru voters were allowed to vote for the Mizoram polls from outside the state following Gauhati High Court order in 1999. At least 11,500 Bru voters in the relief camps have votes in nine Assembly constituencies covering three districts Mamit, Kolasib and Lunglei.